The Central African Republic is located in one of the most conflict-prone regions of Africa, which includes Sudan, Chad, and the Democratic Republic of Congo. Photo credit: hdptcar (via Flickr, Creative Commons license). Over the weekend of March 23-24, the brittle government of President Francois Bozize was finally overthrown. 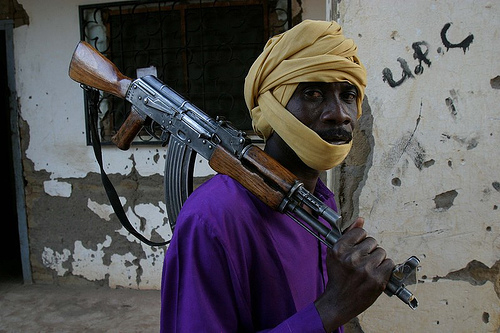 A coalition of rebels known as Seleka has now seized control of the capital city, Bangui. Bozize and many senior figures from his government have fled the Central African Republic (CAR). This new development re-confirms the country’s status as a failed state. Here are two key indicators of that status. Limited rule of law. The ousted president, Bozize, came to power through a military coup in 2003. Despite CNN’s designation of last weekend’s change of government as a “coup,” the successful rebellion has led to another unconstitutional change of government. In response to the illegal action, the African Union has suspended the membership of the Central African Republic. And, not surprisingly, the new Seleka government has suspended the country’s constitution, promising free and fair elections within a few years. A stark core-periphery pattern. As I have previously written, the divide between the CAR’s capital city and its hinterlands is immense and longstanding. The core region around the capital has been the main focus of government authority, while the outlying regions – especially in the North and the East – have largely existed outside national government influence. In the past decade, these “ungoverned spaces” have been regionally important as fighters and weapons have flowed across porous borders with Chad, Sudan, and the DRC. If the rebels are successful in retaining control of the capital, will they be any better at forging a geographically unified, well-functioning country? Outside of obvious concerns about an intensifying humanitarian crisis in the CAR, it does not seem that the international community is all that concerned about the situation there. Notably, France did very little to oppose the fall of Bangui. Yet, we should applaud the African Union (AU) for quickly acting to suspend the CAR and sanction the country’s new leaders. For all of its dysfunction, the AU has at least created a regional political culture that stigmatizes unconstitutional changes of government. If only the AU would get tougher with African dictators that run sham democracies. This entry was posted in Uncategorized and tagged African Union, CAR, Central African Republic, Chad, DRC, failed states, Foreign Policy, France, Francois Bozize, rule of law, Seleka, state failure, Sudan by Brennan Kraxberger. Bookmark the permalink.